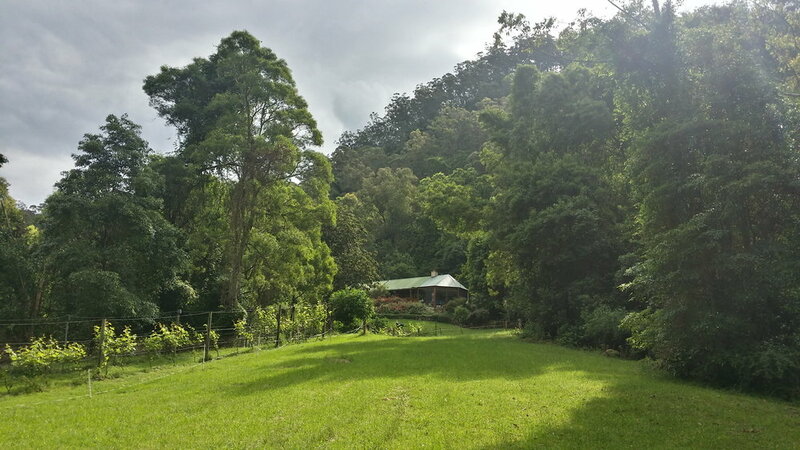 We headed out again early on the 6:40am train for another long, uneventful 13 hour travel day, and met our WWOOFing hosts Jenelle and Chris in Moss Vale with the final destination of Kangaroo Valley. It's a pretty remote area down in one of only a few completely enclosed valleys in the world. Down in the valley dairy land reminiscent of the Tillamook area in Oregon eventually gave way to dark, overgrown, jungly rainforest. Our host Chris made a comment that a couple of Canadian girls whom they had brought out after being stuck in a bad situation in the city probably became nervous on the long drive out as the isolation becomes more and more apparent. It turns out that it's a wonderful place that doesn't seem that isolated once you’re there. There's a small vinyard, and a beautiful home with a view across the valley, bird watching and tons of wildlife. It was extremely moist due to a nearly constant mist, so it's no wonder that we came across a ton of leeches, one of which got a full meal out of Samantha before she realized it was on her lower leg. We really ended up enjoying Chris and Jenelle's company. They're fantastic hosts with a lifetime of travel experiences around including a 4 month trip from India to London through the middle-east just before the 9-11 attacks in a 'combi' (camper van). Our after dinner chats were fascinating hearing tales from the road such as Chris having a Kalishnikov rifle shoved in his face in Afghanistan, ending up sharing time around a campfire with Mujahadeen soldiers on their way to join up with the Taliban, and Jenelle being gifted a book of most-likely political poetry written in Farsi that she's not had the courage to have translated after the world has become so geared toward fighting Islamic terrorism. Jenelle wrote a book about their experience called “Not Crazy Just 60”. I really hope that when we're their age, we have their share of experiences, and are still creating new ones the way they are! We helped them out for a few days primarily doing jobs around their small farm to make things more manageable for them, as they're now in their mid 70s. We saw a ton of wombats at a local recreation area and there were several echidnas and a few wallabies running around on their property.